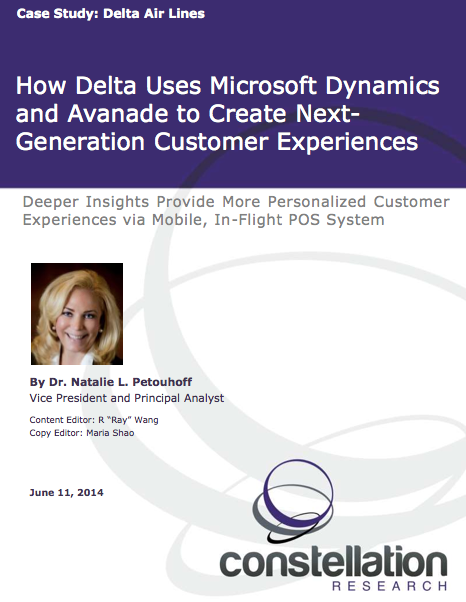 How Delta Uses Microsoft Dynamics and Avanade to Create Next-Generation Customer Experiences | Constellation Research Inc.
Delta Air Lines' legacy in-flight point-of-sale system (POS) system could only provide very basic transaction data for items like meals, headphones and duty-free items. Declines in credit card purchases remained undetectable until the flight landed, leading to lost revenue. In addition, the in-flight POS system lacked the ability to communicate in real time with Delta's CRM system, resulting in a disjointed customer experience.